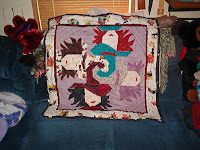 Here it is quilted and with the binding on it. It's raining today and getting cooler here. But I think I'll stay inside anyways. Hubby is making ham for dinner , plus stuffing and peas so that will be yummy.